Ascend Media is a diversified business media company that owns and operates professional magazines and journals; organizes trade shows, conferences, and educational programs, and maintains online properties and databases serving the medical and healthcare industry. The company was formed and incorporated in 2002. 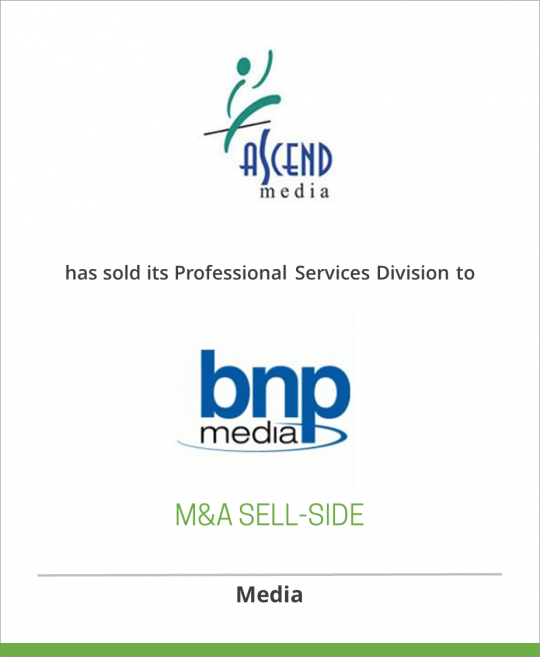 Ascend Media is financially backed by CCMP Capital (formerly J.P. Morgan Partners) and Veronis Suhler Stevenson, and is headquartered in Overland Park, Kansas. BNP Media, the largest family-owned b2b media company in the country, helps people succeed in business with superior information through its portfolio of magazines, websites, conferences, tradeshows and market research. BNP specializes in the food, beverage, packaging, manufacturing, gaming, architecture & construction, mechanical systems and safety & security markets. BNP owns and operates more than 60 magazines, 40 events and 75 websites. BNP Media was incorporated in 1926 and is headquartered in Troy, Michigan, with offices around the country.